As the weather warms up, that sprinkler system does start to get tempting. Sure, it’s an investment, but it will make sure the grass and garden alike are watered just right, with little thought. And hey – the kids will enjoy it too! Of course, Zoysia grass doesn’t need much watering! Unless there hasn’t been any rain for some time, it will do just fine with very little maintenance. But what about those flower beds? While sprinklers might seem like a great solution, unfortunately they tend to waste a lot of water. As OrganicGardening.com points out, we’ve all seen that sprinkler that waters the sidewalk more than the garden! Not only are sprinklers far from “green” when it comes to conservation, they can actually encourage plant diseases, which could mean an end to the green in your lawn and garden, too. Instead, we recommend judicious hand watering with a hand sprayer or even a watering can. So, how do you know if it’s time to water your garden? A good measure is that green thumb of yours! Stick it in the soil about two inches, and if the soil is not moist, it’s time for a little shower. For those looking for a more precise way to measure your garden’s moisture we offer an easy-to-use Moisture Meter. Just be sure not to overwater – the soil should get nice and damp, not soggy, when you’re finished. 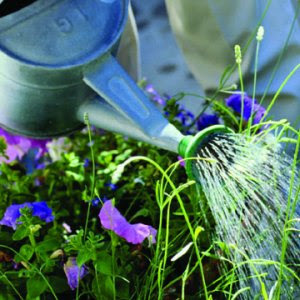 To make the most of your water, put it on your plants early in the morning before the hot sun comes and evaporates it. This way the garden has time to drink it up and you’ll get more bang for your drop! Of course, the best way to conserve water and make sure that your garden doesn’t get thirsty is to let Mother Nature do the job. Watch the forecast carefully and schedule your regular watering so it doesn’t fall too closely to an upcoming rainfall. The time is here. The weather is warming and your grass is starting to green. To get your grass ready for a healthy, lush summer, there are a few maintenance tasks for you to do. First things first – weeds. While Zoysia grass is incredibly resilient and can choke out many weeds on its own, it is not entirely immune to the occasional weed. Start your spring prep by spot weeding any that have appeared over the winter or early spring. If you find yourself faced with weeds from the crabgrass family, you’ll need to use a pre-emergence product that will kill the seeds before they have a chance to germinate. For the best results, pre-emergence products should be used in early spring and again in the fall. As new green shoots start appearing, this is the time to apply your fertilizer. There are two great options for giving your Zoysia a leg up as the growing season starts. First is our water-soluble Nutri–20 fertilizer. Second, we now sell organic Turf Thrive, a concentrated blend of bacteria and microbes that strengthen your lawn naturally. Remember most granulate type fertilizers are not appropriate for zoysia lawns. Read all labels carefully. If possible, take some time to aerate your lawn. It is one of the single best things a homeowner can do for an established lawn. Aeration is the process of poking holes in your lawn to allow water and nutrients to penetrate to the roots of the grass. Aeration machines are generally available from equipment rental stores. We’ve created a list of Do’s and Don’ts of lawn aeration that can be found here. Finally, check to see how much thatch is building up in your lawn. This layer of material called “thatch” is an accumulation of cuttings and stems that build up between the grass blades. This buildup can prevent air, water, and light from reaching the surface of the soil. You can remove thatch by using a hard rake or our organic liquid thatch remover. This doesn’t need to be done every year, just when necessary.